When you ask a sidemount diver what they love most about sidemount they will invariably include the word, “freedom”. The feeling of sidemount diving is akin to freediving. The feeling of being one with the water and being able to move through it freely in any orientation. This feeling of freedom and weightlessness is nirvana for divers and one of the very real reasons that sidemount diving has experienced such growth. There are of course, other reasons such as sidemount being fit for purpose when diving; caves, mines, sumps, and wrecks where the ability to navigate narrow restrictions is a requirement. But there are several fundamental benefits that sidemount diving provides that make it a good choice for any diver looking to move to multi-cylinder, open circuit diving. Here's my top seven reasons why you should dive sidemount. Have you ever watched and marveled at a Dolphin, Seal or Shark moving through the water? Their movement is effortless. They have evolved over many millions of years to develop the speed and maneuverability necessary to become successful marine predators. Water is 800 times denser than air and hydrodynamic drag means that an increase in speed requires a many-fold increase in propulsive power. Therefore, reducing drag by streamlining is a vital component of efficiently moving through water. Divers are subject to the same laws of physics and yet for some reason, we seem to pay scant attention to streamlining. Many divers including technical divers, are trimmed down at the feet. This means that they are presenting a large surface area to their direction of travel. This in turn, will cause unnecessary drag and extra effort will be required to move through the water. This extra effort normally represents itself as higher gas consumption rates but it can more worryingly, increase diving stress when working at depth or in currents. So how does the sidemount configuration address this? Simply put, sidemounting your cylinders correctly means all your cylinders are aligned with your body and therefore, your direction of travel. This makes propulsion easier and diving is much more relaxed and comfortable. It is still a mystery to me why so many experienced technical divers wear their deco/stage cylinders at near right angles, almost as a badge of honor. Surely configuring their equipment to be efficient in this environment would provide major benefits. Trim refers to the forward to back orientation of a diver and is usually referenced as; ‘in trim’, ‘head down’ or ‘feet down’. Correct horizontal trim is a basic diving requirement to move efficiently through the water. Good trim is a function of correct weighting, correct positioning of this weight on your body and the positioning of gas in your BCD and dry suit. While good trim can also be achieved in backmount diving, correct horizontal trim is a hallmark of a competent sidemount diver. This is primarily due to the pro-trim effect of having your cylinders at the sides of your body allowing them to more closely align to your centers of gravity and buoyancy. With your cylinders sidemounted, they are either side of your torso. Regardless of your orientation, the resultant of your centers of gravity and buoyancy is always near the center of your body. Turn onto either side, upside down, inverted, upright, it doesn’t matter, you are balanced. Contrast this with backmount where your cylinders are joined and mounted on your back. Turn to your side and you will create a large moment or force wanting to turn you further, to a back down orientation. You can control this with body tension however, it can be disconcerting and it certainly does not allow you to feel balanced in all orientations while diving. Stability is a function of trim, balance and buoyancy control. Being stable means being able to relax almost completely and to stay in trim and balance. It is the resultant state when the force of gravity is completely balanced by your buoyancy while in trim. You are truly weightless but more than that, you are a stable platform and you can now complete tasks or skills while holding your position in the water column. This is important when looking to apply sidemount diving to overhead environments such as caves or wrecks where contact with the cave or wreck floor can cause loss of visibility due to silt. It is also required for decompression diving where you need to be able to hold decompression stops and perform tasks such as gas switches while holding a specific depth. Good stability is not the sole domain of sidemount with skilled backmount divers able to achieve the same result. I would maintain however, that it is easier to develop this skill in sidemount than backmount. In addition to carrying more gas, one of the key reasons for diving with two or more cylinders is redundancy. A mandatory requirement for any type of technical diving, redundancy provides additional safety in the event of an equipment failure or diver mistake. All multi-cylinder configurations provide this redundancy in terms of both cylinders and regulators. Sidemounting however, provides two truly independent gas supplies as opposed to one separated by an isolation valve. This facet has pros and cons however; it is a key point of difference. Another key difference is the location of the valves and regulators. In sidemount, your cylinder valves are in front of your body, typically under your armpits. In contrast, the valves for a backmount twinset are out-of-view behind your head and shoulders. In sidemount, a valve or regulator issue is very easy to see and diagnose. It is many times easier and faster to isolate an issue by closing either valve and switching regulators. 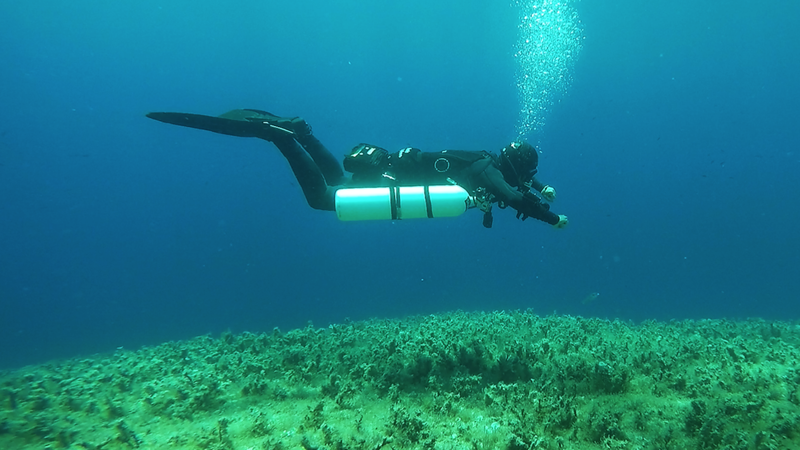 Managing each cylinder individually both in and out of the water means sidemount is easier for those with back or shoulder issues or who struggle with the weight of backmounted doubles. Many believe, incorrectly, that sidemount is problematic for boat diving. I cannot emphasize enough that this is a misconception brought about by poorly trained sidemount divers. There should be zero difference between a backmounted doubles (or twinset) diver and a two cylinder sidemount diver on a boat except that it is easier to stow sidemount cylinders compared to a twinset. Subject to water conditions and the diver’s requirements (e.g. back condition), the sidemount diver has the option to don and doff cylinders on the boat, as for a twinset diver, or to do so in the water. This flexibility is a large advantage for those that might struggle to handle a twinset but otherwise could perform two cylinder dives. Put this all together: streamlining, trim, balance, stability, redundancy, access to valves, and managing equipment and I feel you have a compelling case for diving sidemount. Agree, disagree, drop me a comment below. Want to find out if sidemount is right for you? Try our Intro to Sidemount Course and see for yourself. More here.